Mohini means a woman who enchants onlookers and Attam means graceful and sensuous body movements. 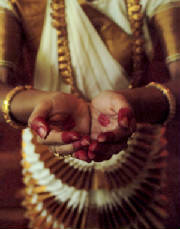 The word Mohiniattam literally means "Dance of the Enchantress". So this dance is an exquisite feminine style with undulating flow of body movements. The theme of the dance is generally "sringaram" or love. Delicate themes of love are performed with suggestive abhinaya, subtle gestures, rhythmic footwork and lilting music. The dance has influences and elements from two South Indian dance forms, the Kathakali and Bharatanatyam. The dance involves the swaying of broad hips and the gentle movements of erect torso from side to side. This is reminiscent of the swinging of the palm leaves and the gently flowing rivers which abound Kerala, the land of Mohiniattam. The world was being threatenned by one demon called Bhasmasura. He pleased Lord Shiva with an austere penance and gets from the god a boon. Bhasmasura wishes that anyone on whose head he places his hand, should perish instantly. Overcome with the greed of power, he tries to conquer the entire universe by placing his hand on Shiva's head. Vishnu transforms himself into a bewitching woman, captivating Bhasmasura with her ravishing charm. Bhasmasura immediately wishes to marry her. Vishnu, in the guise of Mohini, agrees to marry on the condition that he accepts the challege of an encounter in dance. As the dance culminates, Mohini assumes a posture in which her hand rests on her head. The demon imitates and is instantly reduced to ashes.